After a multitude of custom AR15 builds for either good stories or good causes, I really was dieing to do something over the top similar those build I donated for auction to the Mercury One and The Lone Survivor foundations. One of the manufacturers I worked with closely for both the Lone Survivor builds and one of the Mercury One builds was Area 53. Area 53 creates gorgeous billet AR15 and AR308 uppers, lowers and even complete rifles. After working together to do some charitable good, Area 53's owner Charles did something surprising... he reached out to me to offer me a one-off custom billet El Jefe AR15 upper and lower receiver set as a thank you for, in his words, "my hard work with the charities". I was blown away. Charles at Area 53 had a simple request; "Do something very special with them for yourself." So I did...how about $2500 worth of custom one-off "special". I wanted something that as you looked at it, you would just keep seeing more and more custom. When I interviewed with the legendary Jesse James, he emphasized layering the custom details and that the eye should never really be able to take in all the custom elements at once. Although I doubt I will ever achieve Jesse’s level of custom, my goal was to give it a try on this build with a multitude of hand finished parts. Part of that customization were internal parts you cannot see, but in some way enhanced performance. The barrel had a custom gas port, Precision Reflex adjustable gas block, Fail Zero m16 Bolt Carrier Group and Extension, V7 Ultra Light buffer retainer, and a CMC flat trigger that you can just see the shoe on. One of the really interesting parts was the Shooting Innovations Recoil Reduction System which notes a 30% reduction of recoil. 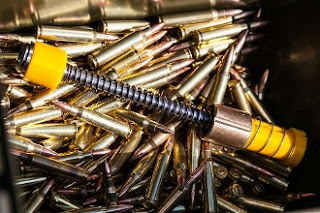 Shooting Innovations LLC Recoil Reduction System (Captured Buffer Spring) - $150 - To even take even more bite out of the very little recoil left, I opted for Shooting Innovation’s Captured Buffer Spring which touts a significant 30% recoil reduction. Combining this with the adjustable gas block, and giant brake netted a rifle which felt like I was shooting an electric stapler with a bit less recoil than my 10/22s. This is a similar concept but a bit different than JP Rifles captured buffer spring. The Shooting Innovations Recoil Management System adds a set of additional springs and floating brass collar which provides extra damping to the recoil cycle. 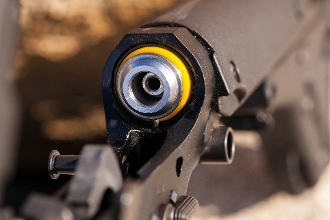 SI claims that the combination of the reciprocation, dual springs, and brass collar deliver a level of recoil cancellation since all are moving at different rates. The system does work and delivers a delightfully soft and smooth recoil. As a side benefit the Shooting Innovations Recoil System also took the “boing” spring sound out of the the recoil. 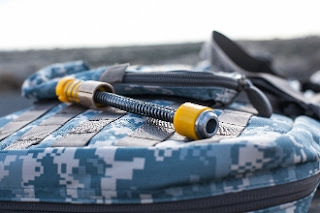 One of the odd installation points is that the Captured Buffer Spring installation requires the removal of the buffer retention detent and spring. Since the SI system is captured already, it is not going to spring out like a regular buffer spring would. I have tested a couple of these captured buffer spring systems and they do work. They work really well when they are just plugged into a standard upper which has not had a world of tweaks, but one the custom builds they can really shine with the ability to further tune gas pressure. The founder of Shooting Innovations, Andy Baker, does have a long history in the firearms industry and has worked for over five years to develop this rather unique captured buffer spring solution. If you are looking to drop a large portion of your AR15’s recoil or just smooth out an already great shooting competitive AR15, I would suggest taking a close look at this $114 system. It may be just what you are looking for for an even better AR.